On March 12, 2019, the United States Justice Department announced it was charging 50 individuals with Federal crimes for their roles in what was described as the largest college admissions scandal in United States history. The ringleader of the vast conspiracy was identified as Rick Singer, a self-styled “admissions coach” who helped wealthy parents fraudulently obtain admission into an innumerable number of elite, American universities. Since Mickelson and his wife Amy were not initially implicated in the case, why might they choose to release a statement confirming their connection to Singer while denying any wrongdoing themselves? Nearly two weeks after the Federal complaint was released, no media outlet has provided a clue as to what the reason might be – until now. SportsbyBrooks.com has learned that the reason Mickelson volunteered that his family had procured Singer’s services in order to, “guide us through the college admission process,” was something that could be seen on the front page of a now-deleted website on same day the Federal indictments were released and 48 hours before Mickelson sent out his aforementioned Tweet. On March 12, 2019, the home page of a website Singer maintained as part of a criminal scheme that most prominently featured wealthy parents fraudulently obtaining admission into elite, highly-selective American colleges and universities for their children included testimonials from satisified customers. 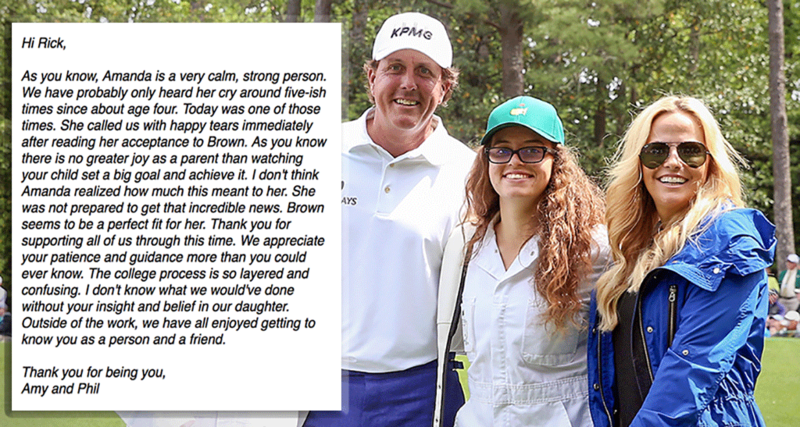 In a column titled, “SUCCESS STORIES,” one such testimonial, from “Amy and Phil” Mickelson, can be seen below. As you know, Amanda is a very calm, strong person. We have probably only heard her cry around five-ish times since about age four. Today was one of those times. She called us with happy tears immediately after reading her acceptance to Brown. As you know there is no greater joy as a parent than watching your child set a big goal and achieve it. I don’t think Amanda realized how much this meant to her. She was not prepared to get that incredible news. Brown seems to be a perfect fit for her. Thank you for supporting all of us through this time. We appreciate your patience and guidance more than you could ever know. The college process is so layered and confusing. I don’t know what we would’ve done without your insight and belief in our daughter. Outside of the work, we have all enjoyed getting to know you as a person and a friend. “Amanda” is Amanda Mickelson, who after graduating from Pacific Ridge High School in Carlsbad, Calif., obtained admission to Brown University where she is currently a student. Gordon Ernst ’89, a Division I tennis coach recently indicted in the national college admissions scandal, was offered the head coaching position for Brown’s men’s tennis team in 2016 while federal authorities allege he was accepting millions of dollars in bribes as a coach at Georgetown University. New, exclusive reports on the largest college admissions scandal in the history of the United States will posted on SportsbyBrooks.com in coming days. PAC-12 PUNTER TESTIMONIAL ON ADMITTED ADMISSION FIXER SITE?